Hospitals ignoring blockchain risk being left behind, IT firms say, and they share advice about getting work underway. Blockchain. Health IT professionals know about the distributed ledger technology so full of promise for boosting EHRs, enabling interoperability, data cybersecurity and streamlining the supply chain. Those are just three of the oft-cited use cases. Myriad others have already emerged, and more are surfacing while technologists and IT executives sort the hype from reality. The overarching question, in the meantime is: What will it take for blockchain to gain a wider foothold in healthcare? IDC on Tuesday published a new report “Blockchain in Health IT Interoperability,” while tech consultant Gartner last week updated an advisory geared toward chief information officers spanning multiple vertical industries. Gartner research published in July 2018 projected that companies worldwide, not just healthcare, will invest some $360 billion by 2026 on the way to a major spending surge that surpasses $3 trillion by 2030. Gartner added that blockchain is not straightforward and, instead, will force hospitals to embrace decentralization within existing business models and processes -- which is going to be a high hurdle given that only one percent of CIOs responding to the Gartner Survey have adopted blockchain and a mere 8 percent are in pilot or short-term executions stages while 77 percent currently have action planned. “CIOs can (and should) now to begin considering blockchain without the risk of being left behind,” Gartner wrote in its advisory. “Hype Cycles are not indicating obsolescence. Re-engineering businesses to the extent that blockchain envisages will take time, but that doesn’t mean it won’t happen and the extent of that change on businesses, industries and society will be enormous. To that end, IDC made recommendations for employing blockchain. First and foremost, weigh the pros and cons of blockchain interoperability and make informed decisions, the firm said. It’s critical to give some thought to how decentralized, distributed and immutable properties might help stakeholders achieve their goals. IDC also suggested that hospitals press for blockchain interoperability with providers and patients, and to coordinate tasks, such as reconciling data and gathering records from various sources. It’s important to adopt blockchain interoperability early to take advantage of low-hanging fruit. And if publicly-driven blockchain interoperability seems too much of a risk, consider going private. Blockchain technologies also offer an opportunity to unleash untapped value and logic from relatively stagnant and siloed data reserves. IDC, for instance, noted that by 2020, 20 percent of healthcare organizations will have moved beyond pilot projects and will be using blockchain routinely for operations management and patient identity. Moving forward, blockchain contributes to reshaping healthcare interoperability by serving as a next-generation middleware that couples health data with decentralized, distributed and immutable qualities, IDC said. With the advent of FHIR and open APIs, blockchain could provide a lattice to accelerate clinical data distribution. Blockchain "could solve the challenge health systems have when their datasets get mismatched, or the problem of duplicate records," said StClaire. For one thing, under the current system, there are "20 different ways you can enter date-of-birth. Not a really great approach." 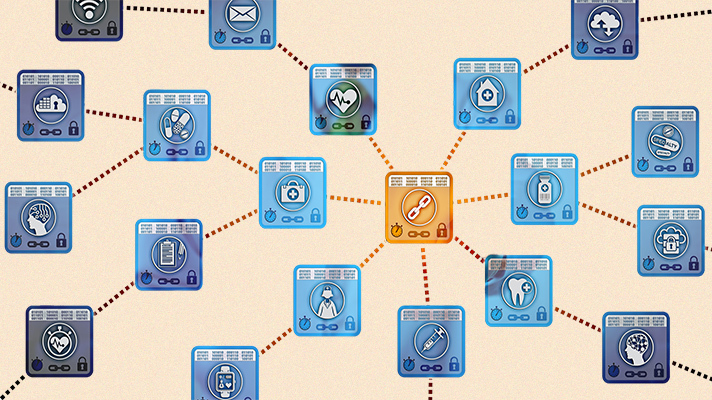 Experts say blockchain could solve the challenge health systems have when their datasets get mismatched, or the problem of duplicate records. Others suggest blockchain could help processing and adjudication of claims, noting that 6 percent of all claims are denied because of incomplete or incorrect information. The list of use cases also includes a master patient index, clinical trials, supply chain and more. Whether blockchain will truly empower the industry with new ways of achieving interoperability or ultimately land in the buzz trash bin -- well that, of course, remains to be seen.